Pope Francis To Visit U.S. Next Year : The Two-Way In what will be his first papal visit to the U.S., the pontiff has accepted an invitation to a meeting in Philadelphia and is reportedly considering stops in New York and Washington, D.C. 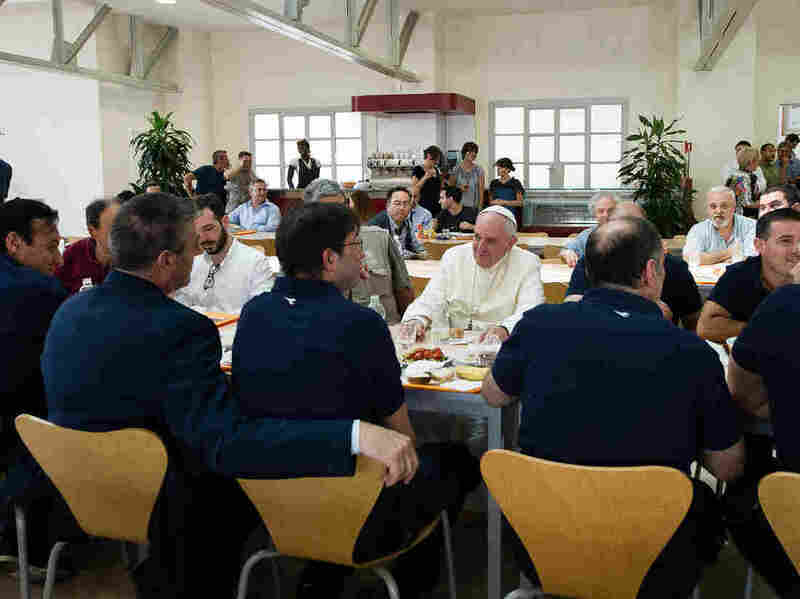 In this photo provided by the Vatican newspaper L'Osservatore Romano, Pope Francis has lunch at the Vatican workers' cafeteria on Friday. Pope Francis has accepted an invitation to visit Philadelphia in September 2015, a trip that would mark his first to the U.S. as pontiff. Catholic News Service quotes Vatican spokesman Federico Lombardi as saying that the pope has expressed "his willingness to participate in the World Meeting of Families" in Philadelphia, and that he's also received invitations to visit New York, the United Nations and Washington, D.C., which he's considering. Time magazine notes: "The Vatican's Pontifical Council for the Family sponsors the World Meeting of Families every three years in a different city. The upcoming gathering is still more than a year away, and Pope Francis is likely to push for more activity on the issues of family and marriage before then — at least if his workrate continues at its current pace." In March, a CBS News poll showed that Francis, who at that point had been pope for just a year, was more popular among U.S. Catholics than either of his predecessors, Benedict XVI or John Paul II, at the same point in their papacies. He enjoyed a 68 percent "favorable" rating, compared with 40 percent for Pope Benedict and 59 percent for John Paul II. Nearly as many, 64 percent, saw Francis as helping the church, while 27 percent viewed him as a "mixed blessing." Much of Francis' popularity has been attributed to his ability to connect with average people — not just Catholics — with such encounters as the one on Friday, in which he appeared unannounced at the Vatican workers' cafeteria, took a tray and got in line amid stunned diners. Cashier Claudia Di Giacomo told Vatican newspaper L'Osservatore Romano that Francis had a plate of cod, a bowl of fusilli pasta (without sauce), a side of grilled tomatoes and "just a few" French fries, but that she "didn't have the courage to hand him the bill." Later, Francis chatted with five Vatican pharmacy clerks at his table. Further to his plan to visit the U.S., CNS says: "Some Mexican media have cited government officials saying a September trip to North America also could include stops in Mexico, but Father Lombardi said that at this moment 'nothing operational has begun relative to a plan or program for a visit to the United States or Mexico. Keep in mind, there is still more than a year to go before the meeting in Philadelphia.' "
In January 2015, Francis is expected to visit the predominately Catholic Philippines and Sri Lanka, a mainly Buddhist nation.